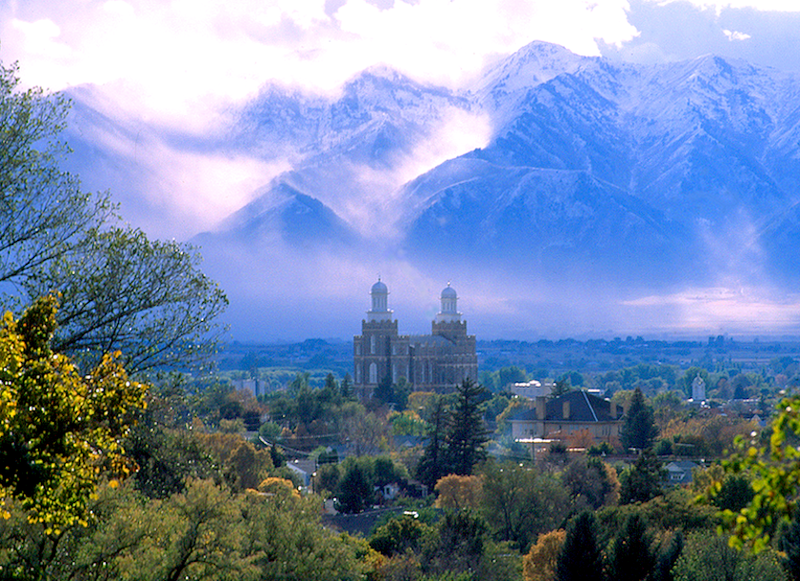 Logan, Utah is a western town built like a western town. The cold water of the Logan River flows through town, mountains rise at the east edge of the small city and the Wellsville Mountains tower over the beautiful Cache River Valley to the west. Morning fog flows down the Wellsville Mountains west of Logan, Utah. The town design gives a feeling of wide-open spaces and uncramped landscapes, and that wide open character is strong on Main Street. Main Street is wide, very wide, many lanes wide, and with parking on each side beyond that. It’s so wide that you should consider packing a lunch before crossing the street. I was there when the street department resurfaced Main Street. At one point the surface was complete but the centerline and lane lines were not yet painted. The street was open, but people were having trouble knowing where to be and many were driving left, then right, across two or three lanes. It was odd to drive the wide street without lines. It gave a feeling of uncertainty and insecurity. It reminded me that we all needed a little direction. In our interpretive sites our front desks are staffed by a variety of people: perhaps an Interpreter, a volunteer, a clerk, or the Ranger, or the Superintendent. Each of these becomes a critical front line interpreter the moment a visitor walks in. At that moment, that front desk person is the most important staff person in the park. When a visitor enters your visitor center they need a little direction in addition to your warm welcome and beautiful smile. In your park they are in new territory. Just wandering around promotes that feeling of uncertainty, insecurity, lack of direction, and lack of purpose. “Hello, welcome, look around” is not enough. That’s that wide road without lines, without direction. Visitors need and want direction. Maslow’s basic needs of safety, security, and belonging are all engaged right here. The visitor needs to feel welcome, safe, know what to do and see first, and feel he can accomplish something. The visitor needs to know a sequence of events that serve as lines to follow. Your visitor needs a great elevator talk! An elevator talk lasts about the time it takes to ride an elevator to the 10th floor – two minutes or so. An elevator talk is direct, clean, simple, friendly, and gives the visitor enough information, but vital information, to be welcome and to know a sequence of events to follow to begin the best experience in your visitor center, then in your park. A well-planned elevator talk gets your visitor off to the right start. Welcome, smile, we’re glad you’re here. Name your site, always use the full name. The visitor needs confirmation of where they are, who operates the place and that it’s important. The full name confirms that. State your site theme so the visitor hears why your site is important. Your interpretation plan has identified overarching themes. Pick the most meaningful one and use it. Give direction. Sometimes it’s important to see the video first because it gives background, overview, and site significance in one planned package. At other sites it may not matter what they see first, but by you providing a sequence to follow the visitor has direction and that makes him feel more secure. A sequence organizes the mind and the visit. Create a logical sequence that’s easy to understand and follow: First, see our exhibits on the left, next, be sure to see the hallway exhibits, then don’t miss the quarter-mile walk to the overlook that begins right out the side door…instant organization! ‘Lines’ people can feel comfortable following and a sequence that makes them feel successful when completed. Maybe you have one exhibit gallery. What sequence can you give for that? “Go in there and look around.” – NO. Pick out the two most important exhibits and note those. “Our exhibit gallery is (there)… its PURPOSE is to… .Be sure to see the exhibit on the left about our first settlers, and the one about the creation of the mountain.” That’s a sequence that states a purpose, shows importance, then gives direction. It provides simple organization that produces a feeling of comfort and confidence for visitors in a new place who want to know what to do.